As you may know, I lost my job in June. For the first time in 39 years, pajamas were an all-day option. I was about to turn 60 and knew my demographic profile was a recruiter’s dream — old white male with a work history in a dying industry. What more could an HR department want? Despite this enticing profile, I put off the LinkedIn recruiters eager to enlist new insurance sales people. Earning a paycheck — which, technically, they weren’t offering — was no longer my only consideration. Requiring only Wheat Thins, DirecTV and the aforementioned pajamas really reduced my expenses. Sixty being the new thirty, I figured I couldn’t afford to screw up the coming decade. It’s too promising as it is. I can schedule a dental appointment anytime I want, for just one example. A friend and former neighbor in North Denver told me that she trusts her instincts about such things, and I should too. Then she sold her house and flew to India. I wondered if she meant I should trust her instincts and fly to India too. I’m a former sportswriter, so I don’t really know what to do if there’s no Marriott. Most of the interesting places in India don’t seem to have one. So, while I was waiting for inspiration, I went out and blew my last paycheck on a boatload of American history books. This is what my instincts told me to do. Don’t ask me why. I suddenly wanted to know how we got here. Not like how my immigrant ancestors got here. How we got here. Another election cycle has come around and I can’t even watch the baseball playoffs without hearing Cory Gardner insulted and then Mark Udall insulted and then Bob Beauprez insulted and then John Hickenlooper insulted and then some stuff insulted I don’t even know what it is. Is this the worst it’s ever been? I try to ignore politics at this point in the cycle and even I know everything I hear on these TV ads is a lie. If you know anything about the issues these insults refer to, you know both sides are twisting them with pretzel logic to make the other guy look like a creep. This is familiar to me because it’s kinda like sports: Do anything to win. I’m expecting steroids to come into play at some point. As I began to study how we got here, I figured out a temporary solution. Digital TV has certain advantages. I learned if I hit rewind and watch an early half-inning over again, I can fast-forward through the rest of the commercial breaks. If I catch up to real time in the seventh, I rewind a little more. That’s just between us. 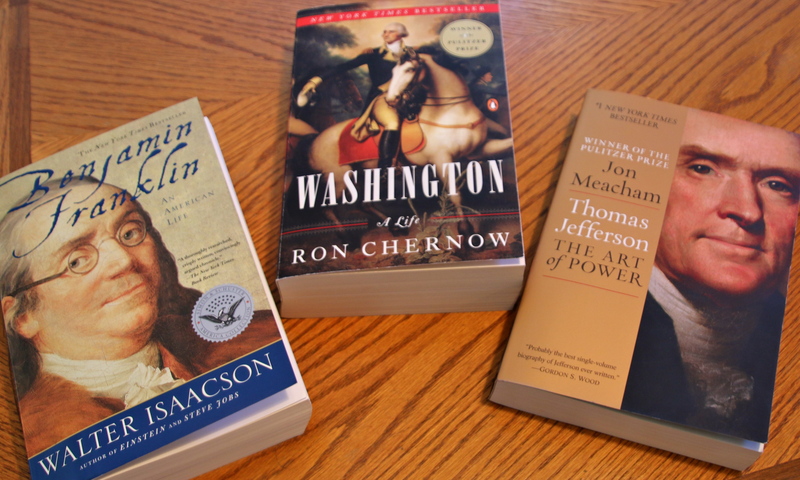 Anyway, I thought I’d start at the beginning, with fresh looks at three of the most celebrated founders: Benjamin Franklin: An American Life by Walter Isaacson (2003), Washington: A Life by Ron Chernow (2010) and Thomas Jefferson: The Art of Power by Jon Meacham (2012). The first thing you realize when you read these books is our partisan political divide is nothing new. Any undergraduate student of American history could tell you that, but it’s been so long since I was an undergraduate that I remember almost nothing about it. Besides, I was too busy working on the school newspaper to go to class. I did know that newspapers went all the way back to Ben Franklin. They certainly weren’t going anywhere. The rift between Federalists and Republicans that emerged out of the constitutional convention of 1787 and persisted through the terms of at least the first three presidents makes today’s partisan sniping look like a game of touch football. The crux of the debate was basically the same big government/small government divide that exists today. So, yeah, people have been arguing about the same stuff for at least 227 years. The difference is America had no experience with either at the time, so it was not only possible to conjure apocalyptic consequences from the other guy’s ideas, it was possible you were right. The paranoia and nasty partisan media that accompany each side in our current federal gridlock are pale derivatives of their counterparts back in the day. Consider that Franklin’s grandson, Benjamin Franklin Bache, was arrested under the Alien and Sedition Acts for what he said about the Adams administration in a newspaper. Adams, famously, could dish it out a lot better than he could take it. Bache might have gone to prison for something he wrote if he hadn’t died of yellow fever first. Federalists, including Adams, were so paranoid Jefferson would dismantle the new government in the name of individual liberty that they demanded assurances he wouldn’t before allowing him to assume the presidency (they had the opportunity to do this because Jefferson’s first election was thrown into the House of Representatives when his running mate, Aaron Burr, got as many votes as he did, an outcome the original electoral college, oddly, did not imagine). Republicans like Jefferson, on the other hand, saw the threat of monarchy in every federal power, which is why the original Articles of Confederation gave the Congress — the sole federal branch of government at the time — virtually no power at all. It’s also why some high-profile American rebels, including Patrick Henry and Samuel Adams, declined to attend the constitutional convention, wanting to leave the federal government powerless. In long-lensed hindsight, each side’s paranoia has a certain logic. After all, the whole self-government thing was a grand experiment. Nobody really knew which design would work and which wouldn’t. From the Republicans’ point of view, monarchy was the default governmental system in the civilized world and America had just fought a long war to get out from under one. They feared a strong central government would inevitably lead to an American monarch. For many of them, Washington’s main appeal as the first president was the fact that he didn’t have an heir. From the Federalists’ point of view, the risk of monarchy came mainly from the possibility of anarchy, which they saw as the likely outcome of 13 sovereign states in constant conflict with one another and a federal government powerless to referee. Shays’ Rebellion in Massachusetts was fresh in their minds as an anarchist warning shot. So who bridged this familiar ideological gap back in the day? Mainly, Washington and Franklin, the two most venerated leaders of the time. Their ability to cross the partisan divide came from very different experiences but a common determination to put the good of their new country ahead of whatever ideological biases they might have held personally. I confess that I do not entirely approve this Constitution at present; but sir, I am not sure I shall never approve it: For, having lived long, I have experienced many instances of being obliged, by better information or fuller consideration, to change opinions even on important subjects, which I once thought right, but found to be otherwise. It is therefore that, the older I grow, the more apt I am to doubt my own judgment and pay more respect to the judgment of others. In these sentiments, sir, I agree to this Constitution with all its faults — if they are such — because I think a general government necessary for us. . . . I doubt, too, whether any other convention we can obtain may be able to make a better Constitution; for, when you assemble a number of men, to have the advantage of their joint wisdom, you inevitably assemble with those men all their prejudices, their passions, their errors of opinion, their local interests and their selfish views. From such an assembly can a perfect production be expected? It therefore astonishes me, sir, to find this system approaching so near to perfection as it does; and I think it will astonish our enemies, who are waiting with confidence to hear that our councils are confounded like those of the builders of Babel, and that our States are on the point of separation, only to meet hereafter for the purpose of cutting one another’s throats. Thus I consent, sir, to this Constitution because I expect no better, and because I am not sure that it is not the best. We have a tendency after all this time to lump the grand roster of founders together — all wonderful, all visionary, you know the honorifics. But given what appear to be intractable ideological divisions today, it seems worth noticing that Franklin and Washington were pretty much the only major players who were able to rise above partisanship. Republicans would cast Washington as a partisan Federalist during his second term, but in fact he was always a pragmatist, his belief in a strong executive fueled by the inability of Congress to help him or his army during the Revolutionary War. Jefferson and Alexander Hamilton, two other revered and important founders, were as partisan as they could be. They were both in Washington’s first cabinet and grew to despise each other. It is not so well remembered that Washington, who solicited advice from his generals and later his cabinet on every big issue, grew so angry with Jefferson’s duplicity by the end of his second term that he pulled a Godfather. By the time he left office, Jefferson was dead to him. And while Jefferson was America’s foremost political philosopher and a grand writer, he could also be . . . how to put this . . . an egotistical, duplicitous hypocrite, if that reminds you of anyone seeking office this season. In April of 1796, the last year of Washington’s presidency, long after Jefferson had quit the cabinet and returned to Monticello, allegedly to retire from politics, he wrote a letter to an Italian friend named Philip Mazzei. In it, Jefferson ripped Washington, alleging he was leading a monarchical party “whose avowed object is to draw over us the substance, as they have already done the forms, of the British government,” according to Chernow’s account. Jefferson had engineered similar attacks on Washington before, but he had never put his name to one. Instead, he had arranged for these attacks to be delivered by partisan newspapers. At the same time, he had written a letter to Washington after leaving his administration denying any responsibility for these scurrilous charges. To suggest that Washington, who had stepped down voluntarily as commander in chief following the Revolutionary War and was about to step down voluntarily as president, wanted himself or anybody else to be king, was insulting and absurd, and there is no record that Washington ever spoke to his fellow Virginian again. “I never saw him afterwards,” Jefferson would say later. At this stage of his life, federal power was still anathema to Jefferson, representing a slippery slope away from liberty and toward monarchy. Sovereignty, he and other Republicans believed, should reside with the individual colonies. But when he was in charge of the largest colony as governor of Virginia 15 years earlier, Jefferson dithered for two days after being warned that the traitor Benedict Arnold, by then a British general, was coming to attack Richmond. By the time Jefferson finally called up the state militia, it was too late. The Redcoats swept in, unabated to the quarterback, you might say, forcing state officials to flee the capital. A few months later, they came to arrest Jefferson at Monticello and he was forced to flee his home in the most embarrassing episode of his public life. His response was to pen a plea to General Washington to bring the Continental Army to Virginia’s defense. This practical experience had no apparent effect on Jefferson’s thinking about the shape of the new government. He seems to have been worried chiefly about the effect on his reputation. He stepped down as governor shortly thereafter. Meacham, an unabashed Jefferson fan, says the Louisiana Purchase shows his “flexibility.” That’s one way to look at it. Another would be that Jefferson’s idealistic ideology proved impractical and he refused to admit it, even when forced to abandon it in order to run the country. Jefferson, of course, was far from the only partisan ideologue around. The Federalists lost control of the government two years after Adams signed the Alien and Sedition Acts. At that point, Republican fears of a tyrannical central government seemed plenty real. When Adams sought a second term, Jefferson (and Burr) defeated him handily. About the only thing that kept the hostility between Federalists and Republicans from tearing the young country apart was Washington, a military hero greeted as a celebrity everywhere he went after the war. Washington assiduously cultivated alliances on both sides, well aware that keeping the country from fracturing was his most important responsibility. Washington’s ability to understand both sides of the partisan divide came largely from the war, the transformative experience of his life. He had been an aspiring aristocrat as a younger man, lobbying incessantly for a commission in the Royal British Army and for land grants to expand his wealth and holdings. It was the British refusal to give him the former and condescending method of adjudicating the latter that initially alienated him from the empire. But during his eight years as commander in chief of the Continental Army during the Revolutionary War, he grew so attached and so loyal to his men, who came from every walk of life, that he developed egalitarian values uncommon among plantation owners at the time. Franklin came by his political moderation a different way. As a 17-year-old runaway landing in Philadelphia long before anyone thought of revolution, he was an aspiring leather-aproned tradesman, a printer. Through his prolific writing, much of it satiric, he became America’s first champion of the middle class. He believed in hard work as the path to success and was suspicious of welfare programs for the poor, believing them an invitation to indolence. On the other hand, he had a natural rebellious streak that made him skeptical of authority, particularly authority based on birthrights rather than virtues or talents. He viewed hereditary titles and wealth with disdain, believing the rich had no more right than the poor to unearned bounty. He was equally suspicious of the aristocracy and the great unwashed. He most admired the tradesmen and shopkeepers he saw as the backbone of the new world. Washington and Franklin were diametrically different personalities, but they shared two key traits — pragmatism and a belief in behaving virtuously for its own sake. It was pragmatism that convinced Washington the federal government needed more power than Jefferson and the Republicans believed. As commander in chief, he was continually thwarted by a Congress powerless to raise money or do much of anything else. He watched his soldiers die by the hundreds for want of adequate clothing and supplies, then visited Philadelphia and found the privileged enjoying grand balls and feasts. Liberty from tyrannical authority was the point of the exercise, but if the colonies were to become a country, they would need a government that could raise and outfit an army for its defense, and that would require a federal authority to tax, among other things. Coming at the debate from a different angle, Franklin was all about practical applications in his scientific experiments. He was far less interested in the why than the how. From bifocals to the lightning rod to the Franklin stove, his investigations were always geared to solving practical problems. He had more of a natural Republican bent than Washington, writing a constitution for Pennsylvania that called for proportional representation in a single legislative body, and he proposed the same solution for the national constitution (it was rejected in a compromise with smaller states, which demanded equal representation in at least one house of Congress, just one of many defeats at the convention he accepted with equanimity). But Franklin, too, saw the practical need for federal power to run a country, particularly with respect to finances. Where is the Franklin of today? Where is the Washington? These were great men who spent most of their lives serving their country, compromising and cajoling to get things done. Surely great men and women will always be rare, but these two were produced by a population less than 1 percent the size of today’s. There must be 21st century men and women with similar inclinations toward moderation, with similar abilities to see both sides of the partisan divide and work toward compromise for the good of the country. The modern day examples that come immediately to mind are few and far between. Among them would be Alan Simpson, the Republican former senator from Wyoming, and Erskine Bowles, the Democrat and former Clinton chief of staff from North Carolina. The Simpson-Bowles Commission drafted a long-term plan to address the federal budget deficit. Both men ended up endorsing provisions they disliked in order to forge a compromise that might be acceptable to all sides. In our current environment, of course, it was acceptable to no one and was dead on arrival in Washington, the capital named for the original moderate. When I was younger, there were lots of politicians who tried to occupy the center of the spectrum. I spent part of my childhood in Illinois, where Charles Percy was the rare politician who succeeded without the help of the corrupt Democratic Party machine. He was what they called a “liberal Republican” at the time, and nationally he was not alone. Similarly, there were politicians called “conservative Democrats,” which included southern segregationists, but also northerners such as Henry “Scoop” Jackson of Washington, who was as hawkish on foreign affairs as any Republican. Today, there is little or no overlap. So here’s one conclusion I’ve drawn from my new hobby: Political partisanship is nothing new. Politically partisan media are nothing new. The only thing we seem to lack today is the great leaders willing and able to bridge the gap.